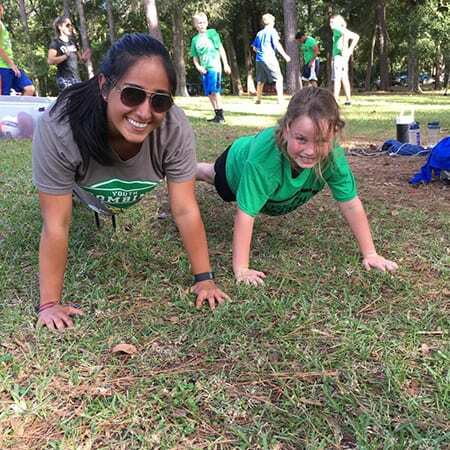 College-Aged Volunteers Teach Kids that Fitness Can Be Fun! Youth Combine was started in 2012 by Executive Director and owner Matthew Howland. He started this organization in response to the severe lack of physical activity and fitness that kids receive in school. Matt wanted the classes to be educational and challenging, yet still fun for kids who are maybe new or unfamiliar with the workout lifestyle. 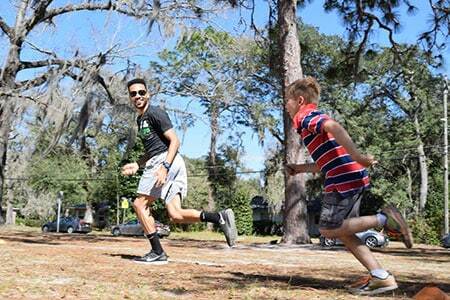 To do so, he brought in University of Florida volunteers to be coaches for the fitness program, all of whom have extensive backgrounds in exercise, sports, and working with children. Youth Combine is now run by Lara Drondoski who has volunteered and interned with YC for 2.5 years before accepting her position as Program Director about a year ago. 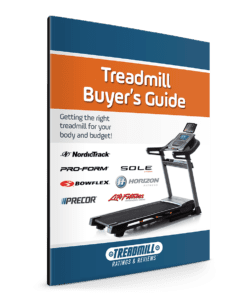 Our organization is centered around the idea that exercise should be fun, safe, and engaging, and should be available to any and all levels of fitness and economic backgrounds. 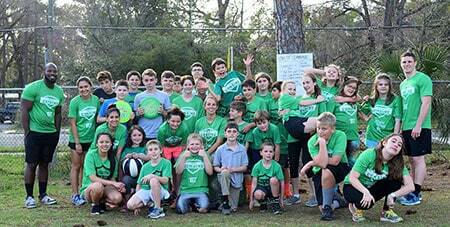 We aim to provide effective fitness programming to elementary and middle school aged children here in Gainesville. Our coaches provide a new workout every day, keeping the program fresh and exciting for our members. The kids and coaches start out with a dynamic warmup, making sure everyone is stretched out and ready for the workout. Then the head coach introduces the workout for the day, usually 3 stations that work all different parts of the body. These could be anything from agility ladders, box jumps, medicine balls, an ab or cardio station- you name it, our members can do it! Each station lasts about 10-12 minutes, followed by a much needed water break. Members rotate through stations, receiving instruction and advice from our coaches. At the end, everyone comes back together for a big game, which can be anything from sharks and minnows to ultimate frisbee. It’s a great way to bring everyone together for a fun finish to the class! Youth Combine is still a young organization, and has had quite the journey in its 5 years of operation. The company has experienced all types of community support and pushbacks, massive growth as well as downsizing. In the spring of 2016, Youth Combine was the largest it had ever been. We had over 200 members, 5 interns, over 80 UF volunteers, and 5 locations. At the time, we were operating at different schools around the city, and using their fields after school so members could stay after class and participate. However, although we were providing an excellent service, many school board members were not fond of our organization and how large it was becoming, so we experienced a lot of push-back. As a result, we withdrew from schools and moved our operations to local parks, and downsized to 3 locations. Currently, we are back up to 65 members, 3 locations, and about 30 volunteers per semester that work with our kids. We are hoping to expand and start reaching more youth around the community soon. There has been positive activity from the community as well, most notably from Catholic Charities of Gainesville. They have been working with us for over 6 months now to provide scholarships for low-income children to attend Youth Combine. Thanks to their contributions, we’ve had an additional 15 kids join our program! These kids may not have had access to this kind of program and family without the help of charitable organizations such as Catholic Charities. Along with our members, we would be nothing without our network of volunteers. Every day we have 5-6 coaches out on the field working with our members, providing excellent one-on-one instruction and motivation. Their hard work and countless hours spent out on the field with the kids shows just how much they care and want to contribute. The best support would be spreading the word and signing kids up! The more members, the greater our outreach and exposure. Ideally, we’d like to get back to that 200 member mark, but it will take help from the community and schools, as well as parents, to see that there is a need for this kind of program here in Gainesville.